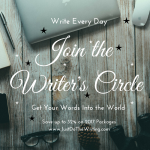 While you might think you don’t need a writing plan, you’d be surprised how many writers I work with who get partway into their process and realize they don’t know what they’re doing and get lost. This tends to lead to a lot of painful self-berating and self-doubt. But why? Many of us come to writing without training, and even if we’re trained in the craft, we aren’t necessarily trained in the practice of writing. Mapping out a step-by-step plan can eliminate a lot of headaches. Not all of them. There are always surprises. We also want to leave lots of room for the Muse to inspire and guide us — and there are unexpected challenges along the road. So this isn’t about getting locked into a rigid framework and then getting frustrated when things don’t go according to plan. Instead it’s about getting clear on what we’re working on and how and when we’re doing it, so we can find the thread again when we get lost in Daedalus’ Labyrinth. One of the things we’ll be doing for my upcoming Deep Dive Writing Intensive is putting together a writing plan. Here’s how you can create one for yourself, whether you’re joining us or not (and make sure you pick up my free downloadable worksheet at the end of this post). 1. Assess what stage of writing you’re in. Are you at the beginning? Doing story or character development? Drafting a first draft? Or revising your 7th draft? Being clear what stage of writing you’re in will allow you to craft a successful plan, because each stage requires a different kind of writing, mindset, and/or approach. 2. Establish your next milestone goal. While you can attempt to make a writing plan for the entirety of the writing process for a book or script, it’s more effective to plan and work in smaller increments. For example, you might be aiming to complete an intuitive/lightning draft, or your story development work or outlining. Pick a target you can break down into smaller chunks. This step flows naturally from first identifying what stage you’re in, because you’ll usually be aiming to complete that stage or the next one. 3. Identify the steps you’ll take or tasks you’ll need to complete to hit your milestone. If you’re writing a first draft, for example, you can estimate the number of scenes you’ll be writing, and approximately how many words or pages you think each scene will be, to generate an estimated word or page count. For a revision, you might first reverse-outline what you have, then assess what needs to change, and then develop a new scene outline. 4. Set a completion target date or deadline. If you’re not working toward an external deadline (e.g. a publisher’s or producer’s deadline), you’ll want to set either a deadline or target for hitting your milestone goal. If I don’t have a hard deadline, I still like to have a target I’m aiming for to give myself something to work toward, even if I’m also allowing myself some wiggle room. Give thought to why and how you’re establishing your deadline to help with staying motivated. For example, I want to revise my sci-fi script (again) during the next Deep Dive Writing Intensive, so my current goal is to finalize my list of revision changes before we start writing on September 20th. Another way to do it is to look ahead in your calendar for “natural” deadlines. For example, you might have a big life event coming up that you’d like to have this stage of work completed by, or a big work project on the horizon coming up that you’d like to be free to focus on. The idea is to give yourself a reason to stay in action. 5. Be clear on what “done” or “completed” actually means. I’ve made the mistake of targeting “finishing” my current draft but I wasn’t 100% clear on what that meant, in my own mind. Did done mean, I’d written all the way through the end of the draft? Did it mean I’d done that plus a read-through and a polish and was ready to submit to beta-readers for feedback? Did it mean that I was ready to submit to my producer? Being clear helps you know what you’re actually trying to accomplish. 6. Estimate your writing pace. If you’re a newer writer, this is a little harder to do. And even if you’re an established writer, sometimes certain sections just take longer. But taking a stab at estimating how long something will take you helps you craft your writing plan. How many words or pages do you usually write in an hour? How long does it typically take you to revise pages? How long to develop a character? In my experience the heavy lifting usually comes in the story development stage, whether I’m writing a new draft or revising, so I allow a lot of time for either story development or assessing what I have and how I’m going to take it to the next level. 7. Gauge your available time. Look at at your calendar, and then your completion timeline. Now check, does the math work? 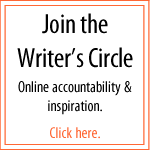 Do your pace, your deadline, your available time, and your writing plan actually work? For example, if you want to write 10,000 words, you have 60 minutes a day available every day for 2 weeks, and you write 500 words in an hour, you won’t quite make it. You’ll only get to 7,000 words in that amount of time, so you’ll need to adjust. Or if you’re targeting 5,000 words in 60 minutes a day, every day for two weeks, and you typically crank out 800 words per hour, you’ll have left an overly generous allowance. Also a place to adjust. Once you do the math, you can tweak the variables as needed until you have something that works. Extend or retract your deadline, increase or reduce the time in your schedule, or adjust your goal to make it work. 10. Write down your plan and schedule it. Once you have a workable plan, write it down. Writing really can become a labyrinth, and it’s surprising how easy it is to get off track or lose your way. Having your plan in writing will help you stay the course. Make sure you schedule your writing time on your calendar too. 11. Leave space for life and divine intervention. Even while you’re crafting this plan, make sure you’re mentally allowing for life to happen and divine intervention to occur. 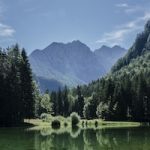 It’s far better to set yourself an easier set of tasks and succeed even if something goes wrong or is unexpectedly slower or harder, than it is to lock yourself in and be disappointed or be hard on yourself if something goes awry. This is about having (and learning) resilience as a writer. Or you may be inspired by the Muse and something will end up being easier or different than you expected. Or you’ll discover that the Muse won’t allow you to write the “easy” version and you’ll be doing something harder. That’s all about trusting yourself, her, and the process. Make room for yourself, life, and the Muse, and you’ll be good to go. Click here to download your Writing Plan Worksheet to help you craft a plan for your writing or get a jump on prepping for the Deep Dive if you’re joining us. Interested in possibly joining us for the next Deep Dive? 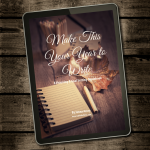 If you have a dream to write or create, you probably have your sights set on the new year as a good time to recommit to your goal. You probably also believe that once we’ve passed through the holiday ring of fire, you’ll have cleared a lot of new space, time, and energy that has otherwise been occupied with shopping, events, and clearing your desk for the holidays. And, surprise, surprise, there do tend to be a few glorious days in January of peace and quiet… but usually with the essence of guilt and procrastination swirling around the edges. Because even though you’ve promised yourself you’ll get started right away on your writing or art or dream, you don’t. It looks like needing time off (and you probably do actually need it) but it’s really fear. Resistance comes up around anything worth doing. We tend to recommit — at least mentally — to the concept of doing those things in the form of new year’s resolutions. Those resolutions trigger even more resistance. Which leads to more distractions, and smokescreens, and procrastination. And stress. And self-doubt. How about instead of making resolutions, we decide to make new life decisions about setting ourselves up for a long-term, sustainable, regular practice of our art? No more grand sweeping gestures and big talk but instead an actual realistic, attainable plan to take small, daily actions to move you toward your goal? If you want to move your business forward, commit to doing the hardest tasks first (usually marketing, right? ), for 15 minutes a day, every day. If you want to paint, set yourself up so that you can paint a little bit every day. Use the two-second rule to make sure your watercolors and sketchbook are close to hand. Find the smallest increment of absolutely do-able, sustainable, accomplishment you know you can meet, and commit only to that, nothing more. If you find yourself not doing it, make it smaller. And let me know how it goes. Click here to share your thoughts. I love reading your comments and insights.